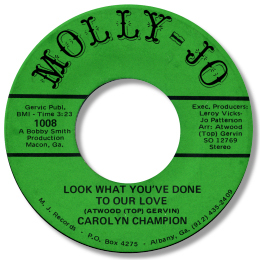 Nothing that Georgia Singer Carolyn Champion cut comes near to the passion and emotional commitment that she shows on Look What You’ve Done To Our Love. In her tone and phrasing you can hear echoes of Shirley Brown and this blue feeling song is simply stunning. Veteran Macon producer Bobby Smith and arranger/writer Atwood “Top” Gervin bring all their expertise to bear, using tastefully echoed rhythm guitar, electric piano fills and beautifully arranged horns to create a perfect backdrop for Champion’s pain. Love that change of pace in the bridge as well. 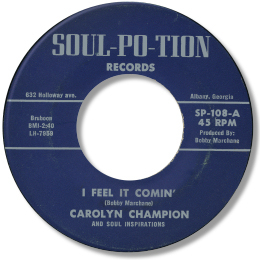 Of Carolyn’s Soul-Po-Tion 45s her first is easily the pick. Not only is I Feel It Comin' the best of the songs, but Bobby Marchan’s production values are way higher than those usually employed by Jesse Boone for his own label. A horn section no less! And a very good pianist, making this a fine southern side. She does a pretty good job on Conway Twitty’s “As Soon As I Hang Up The Phone” as well but the determinedly “low fi” approach of the production does her no favours.